Behavioural problems covers a wide range of topics. What is considered a problem for one owner, may not be seen as one to another, and whether the cat sees a problem with it is a totally different story. Whatever the issue, if your cat has experienced a sudden change in behaviour- your first port of call should be a vet. There may be a medical reason for the issue which needs resolved, and this may fix the problem behaviour at the same time. If not, you should ask your vet to recommend a qualified behaviourist to help identify triggers and reasons for the behaviour. If you would like to talk to us about a particular problem, or have any questions – call us on 0141 779 3341 or email Glasgow@cats.org.uk. There are many different reasons for aggression, by understanding the cause you may be able to help your cat feel calm and secure- reducing the aggressive behaviours. Defensive- A cat will normally run from anything they see as a threat, but if they feel they cannot do this- they may defend themselves. Play and petting- Cats normally prefer short and frequent interactions, whereas humans prefer less often and more intense. This can overwhelm a cat, and can result in limits to how much play and petting they can handle. Territorial- This usually occurs when cats meet on disputed ground, or while passing through the others territory. Pain- Pain reduces a cats tolerance level- leading to seemingly unprovoked aggressive reactions to actions which previously evoked no reaction. Cats can become aggressive if they are kept indoors without stimulation, access to key resources and an outlet for their hunting instinct. Young cats can often display more aggression than older ones, and similarly non-neutered cats are known to display aggressive behaviours more commonly. A misunderstanding between human and owner can also result in seemingly unprovoked aggression. The key to dealing with aggression, is to identify the situations in which the behaviour takes place. Often there is a key link between different episodes in aggression, and identifying these links can help create an environment where the cat does not feel like it has to display these behaviours. A simple step you can take immediately, is to provide your cat with somewhere to hide. This can be something as simple as a cardboard box on its side or a space under the bed. This helps to make them feel safe and secure- and allows the cat the ability to perform its natural behaviour when under threat. Make sure to leave the cat alone if it is hiding. The ability to get up high further increases a cats sense of relaxation- shelves, wardrobes, windowsills- access to these key resources should help alleviate the problem. These diagrams help explain body language and signs of stress in cats. They may be trying to tell you something is wrong. If your home doesn’t have a litter tray, it is very important to put one in. Some cats only feel safe using a tray in the house, especially if a neighbourhood cat is causing problems. Cats find toileting very vulnerable, choosing a quiet, private location to do so. If a stressful incident occurs outside and there is no litter tray provided- the cat may find a quiet place inside to pass their waste. While it can be frustrating- it is important to remember never to punish your cat. This will most likely increase the anxiety causing the problem, making it worse. 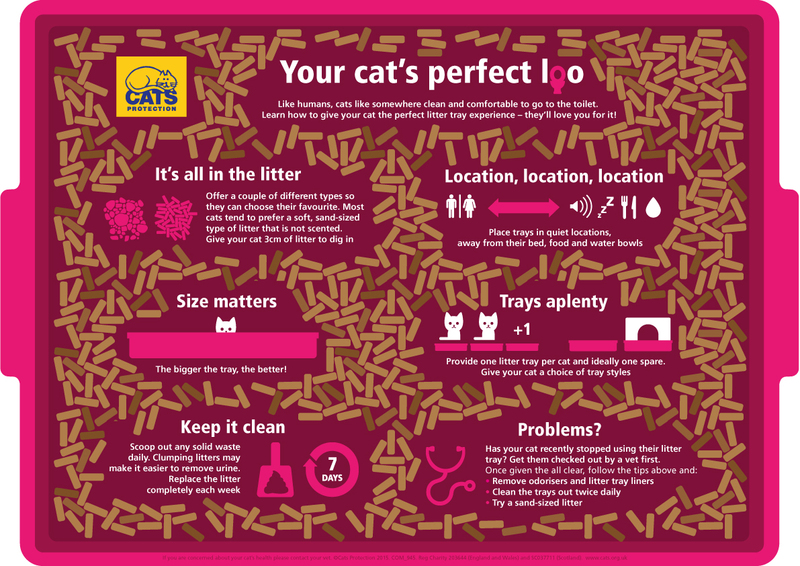 Follow the below image for advice on litter trays and where to put them. And as always, consult a vet or a behaviourist. Urine spraying is a completely different behaviour to normal toileting. Cats normally urinate from a squatting position and produce a large puddle of urine in a secluded spot. In contract, cats spray urine to leave a scent message for themselves and other cats. Cats spray by backing up to a vertical surface in an open location- squirting a spray of urine from a standing position. Urine spraying is a normal behaviour that can be performed by any cat- but spraying indoors may be a sign that something is wrong with them medically, or that they do not feel secure in their home. Cats tend to rub their cheeks to mark their territory- and the need to resort to spraying inside may indicate they feel threatened there. Try and work out what makes your cat feel threatened- and then take action to eliminate the threat. This can be a complicated step, as there may be several factors involved. Spraying can often be related to a change in their environment, in particular if the cat sprays on internal doorways or hallways this may be a strong indicator they come into conflict in these areas- so the problem may be inside the home. If the cat sprays on exterior doors or windows, it may feel threatened by something outside the home- such as another cat. The more secure and safe you can make the cat feel, the less likely they are to spray. Provide extra hiding spots and areas up high to enhance this feeling. And should neighbouring cats be using your garden, see keeping cats out of your garden for suggestions. Cats scratch for two main reasons- to keep their claws in great condition, and to communicate with other cats and leave reminders for themselves through scent glands between the paw pads. Because cats have a desire to keep their claws in good condition, if outdoor access is limited- they will have to scratch in your home. If there are multiple scratching spots- including windows and doors- it is likely they are scratching for communication reasons. The most common cause of indoor scratching is the presence of another cat. Some cats learn that scratching certain objects, such as your sofa means they get more attention. This is why its important to praise your cat when they scratch a post, and ignore them when they scratch things you don’t want them to. It may also be a sign of stress or anxiety- try and identify what could be worrying your cat and remove the threat or source of the problem and the behaviour should reduce. A qualified behaviourist can help uncover the cause. Make sure the scratching post has a heavy, stable base to prevent accidents. Try a scratching post tall enough for your cat to scratch at full stretch. Increase the amount of play offered to your cat.